We think this probably goes without saying, but the entire Annmarie team is crazy about skin care. Because of that, we have created an environment where we are able to pamper our skin whenever we feel called to it—there is almost always someone walking around the office wearing a mask or using a cleanser or talking about a new way to use our products. You already know that we have created a synergistic line of products that are absolutely fantastic but we don’t make a chemical peel. Making a peel is an intricate process and we like to keep our skin care line as simple and luxurious as possible but that doesn’t mean that we don’t squeal with joy when we find a new peel that’s free of unsafe ingredients. Enter MyChelle! They have a few amazing peels (and we’ve been thoroughly enjoying them here) but the one that really got us jazzed is the Fruit Fiesta Peel! Hearing the words “chemical peel” can be a little scary for the natural community so we think it’s important to talk about what this peel actually is. AHA stands for Alpha-Hydroxy-Acid, these acids are found naturally in fruits and they gently exfoliate. Because they’re made from fermented fruits, they’re loaded with amazing vitamins and antioxidants that are easily absorbed by the skin. Depending on the ingredients and the pH of the peel, AHAs can be stimulating and intense or mellow and refreshing. While you want to make sure that you’re choosing the right AHA for your skin type, they are one of the safest ways to exfoliate and renew because they are made with naturally occurring acids that don’t burn or damage the skin—of course there is always exceptions to that rule so if your skin is super sensitive you’ll want to patch test it first. If you’ve been following us for some time, you know that we always vet the ingredients of the products that we show you. We chatted with the MyChelle formulation team and were impressed with how transparent they are about the ingredients in their products—everything from listing every ingredient to what the more complex ingredients are derived from. We didn’t go the extra mile to have them tested but we trust them when they say that their whole line is made with safely sourced, non-GMO ingredients that are vegan and free from artificially created ingredients like parabens, phthalates, or petroleum based additives. MyChelle uses fruit acids from foods like apples, grapes, sugarcane, and berries in this peel to exfoliate. What we like best about this peel is how gentle it is while still being effective. There are a lot of people on our team with sensitive skin and all of us were able to use this peel, no problem. Often times a peel leaves a sensitive person with a bright red face and an uncomfortable tingling that feels like a short-lived sunburn but this peel never got past a slight tingle that wasn’t totally unpleasant. The results were immediate and left our skin soft and feeling vibrant after the first use! Even better news is that our COO, Rachel, has been using this peel for years as part of her weekly routine and attributes her glowing skin to the gentle stimulation and exfoliation that allows our skin care to absorb into the deepest layers of her skin. We are so excited for you to try this product and we can’t wait to hear about how much you love this peel! Do you use a peel for your skin? Let us know in the comments below! If you haven’t subscribed to our We Heart list, check it out here. Every month we feature a product we love from a company we trust! We get the pleasure of telling you about other small businesses that are doing great things and bringing sustainable, safe products to your life. This is one of our favorite ways to create a community that is focused on integrity and natural beauty in our world that can be an overwhelming place to make health-conscious decisions. Alcohol Denat., , Phenethyl Alcohol, are listed in the ingredients. I was under the impression that alcohol was not good to put on the skin. Despite being at the bottom of the list, are these still acceptable ingredients to use? This is a great questions and truthfully, it’s kind of in a gray area! In general, alcohol in your skin care products isn’t a good sign – it can be really drying to the skin – but there are times when certain types of alcohol are acceptable, like in a toner for seriously oily skin and clogged pores or in a peel like this one. It’s not something that you want to use all the time and you definitely want to read the other types of ingredients that are in the products because alcohols are catalysts that can increase penetration and absorption rates. AMG sent me a small sample of the Fiesta Fruit Peel and I finally got to test it tonight! I have to say, never having experienced it before it was definitely shocking and unexpectedly painful. Had I been a little smarter, I would have done more research before trying it so I knew what was going to happen. It was quite comica actually, my husband laughed and gave me a supportive snuggle until the burning subsided. Although it was incredibly uncomfortable for me the results are AMAZING. Even he said my skin was looking incredible. I’ve never seen my skin glow so much! And will definitely consider buying the full sized product. Are there any other products from MyChelle that AMG recommends?? We like the MyChelle company but this is the only product we have specifically vetted from them. We would suggest checking out the ingredient labels for each product you’re wanting to try. I stay in Singapore. If I want to buy your products how to get it ?! As a natural health and beauty blogger I love trying out natural skin care products, I have had such great results with your products and love telling others about them. But I also love the way you will promote another company that others might see as competition. In this case, it’s collaboration. 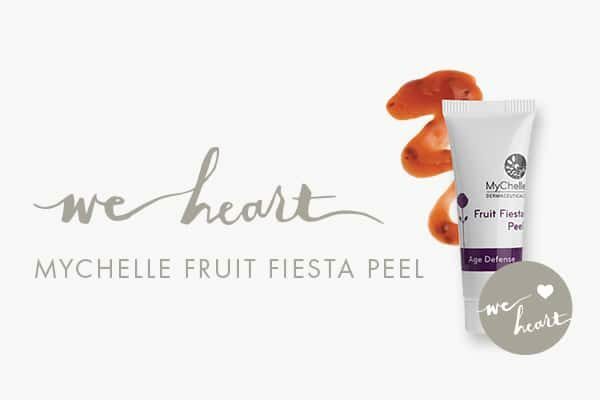 I have actually used the Mychelle Fruit Fiesta Peel several years ago and loved it. It was a little tingly, but left my skin glowing. Love to see companies that are trying to make a difference working together. It’s a win-win! So what’s the difference between a peel and an exfoliating face scrub? I have never had a peel, chemical or not. I am 59 and noticing how much I hate my much earned lines and creases? I am wondering if this will help? I love Anne Marie!